The guesthouse KOWLOON is a cheap guesthouse in Yamanote Line in Tokyo and Kagurazaka. Welcome to Guest House Kowloon! We are situated in Kagurazaka, Tokyo. 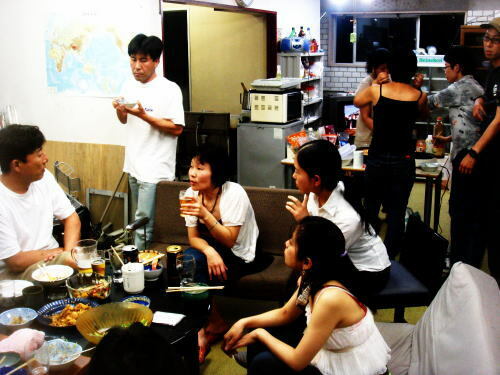 We offer the cheapest accommodation among guesthouses located in inner Tokyo. We are now offering a special discount: 27,000 yen for the first 30 days (nights). There is a female only dormitory available in some of the houses! 36,000 to 39,000 yen from the 2nd month. We require deposit of 10,000 yen. The half of the deposit will be refunded after maintenance fee is deducted when you move out. *Our accommodation style and facilities suit all guests such as tourist, working holiday maker, student, artists, job-seekers, backpackers, and so on. It could be convenient for you when you just arrived in Tokyo and get started new life in Tokyo. Female dormitory is also available. Please pay all the necessary amount in advance as you check in. Guest House Kowloon closed in June 2013. We had lots of interesting guests since it opened, however, due to the decrepitude of the building, we had to close the distinctive guesthouse. Our other guesthouses inherite its feature and character so please check out! enclave in the middle of British Hong Kong for decades. after the City but we are not related to it at all.